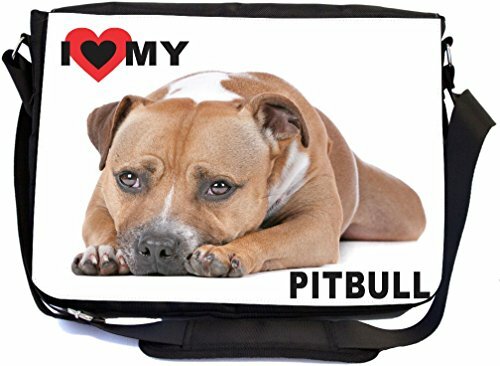 Whether from home to the office, on a business trip or to school, the I Love My Brown Pit-bull Dog laptop bag notebook bag messenger bag school bag keeps you comfortable and your cargo safe and sound - this bag features pockets on the outside below the flap for your cellphone, pens, iPod, notebook etc. And also a zippered compartment on the inside, with plenty of space to store your textbooks, folders, files, etc. And up to a 14 inch laptop (laptop sleeve sold separately) - the vibrant image on the front is professionally printed and will not fade or peel with time and this bag will surely be an eye catcher wherever you go with it. Disclaimer: all images are printed directly into the material - the Texture of the image will always be a flat surface. Any images that appears to be 3D, textured, or glittery are flat printed images.